It's a beautifully blustery bright and cold day here - absolutely perfect for kicking around in leaves. I just love Autumn days like this - wonderful! Do you remember the Mollie Makes Apple Jacket which was my first crochet project? The pattern has been published online today in advance of Apple Day on October 21st. If you'd like to make one of these ridiculously cute (or 'rediculous BUT cute') little items, and didn't get the magazine, you can now get it here! It's a great little project, even for total beginners - plus it doesn't take long or use much yarn! 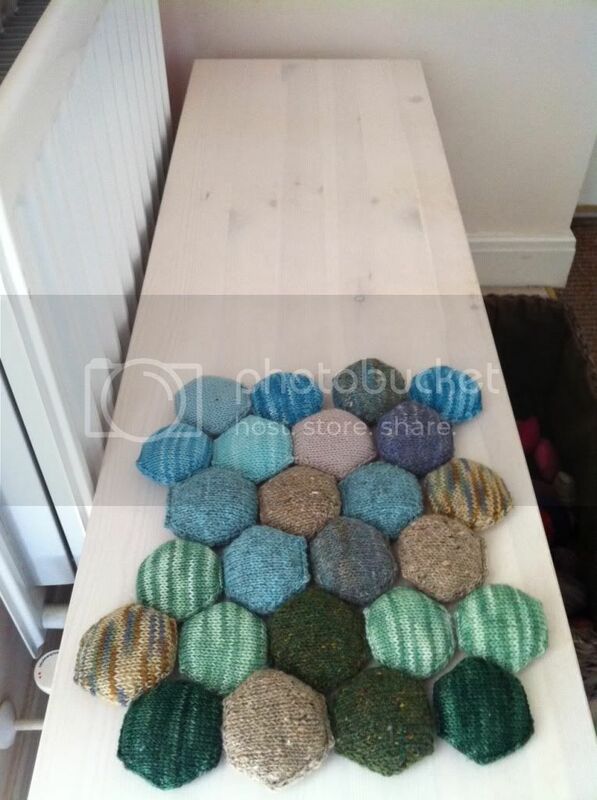 ....BUT it seems I'm almost 1/3 of the way to having enough greens and neutrals for my mini project of a bench seatpad! If it hadn't been for the distraction of the sitting room circles, I'd have made much more progress this week (I'll update on that tomorrow). I've still not decided whether the rest will become a little quilt, a throw, cushion pads or something else entirely and a pink, purple and a red (red!) have been knitted this week too .... I think the not knowing is part of the fun, and they are just so tactile and lovely as they are - even a few non-knitting friends appreciate delving into the basket for a fondle - so there really isn't a hurry to commit them to anything in particular. Before I go, just a little note to the other One a Day'ers (and the other bloggers I follow who may be reading): Our broadband is being eaten up by D's work at the moment so I'm struggling to comment but I'm reading your posts on my phone via a Reader and I am in awe of some of your amazing projects. So much inspiration and more lovely blogs to follow - I'm planning to compile a list of my current favourites when I can get online "properly"! You can see the other One a Day projects via the link at Carole's blog. Hope to see you tomorrow for WIP Wednesday and a peek at those circles! I advise anyone getting the apple cozy pattern from that link not to read the comments ;) Seems the non-crafters really don't get it! Those are a lot of puffs! That apple cozy is lovely! Your puffs are really pretty. I think that some cushions are definitely in order! I love all of your hexi puffs, but I'm really drawn to the rich reds and purples, they are stunning! So many hexipuffs! So cute! Can't wait to see what you decide to make on them. I love the "hallway color" hexis! Oeeeeh look at the purple popping out right now! The colors really have more effect with the blue and the green. They are growing in numbers rapidly! I posted a similiar comment at another one a day'ers who is making this same project - I'm also making a sock yarn blanket, so even though I bought the hexapuff pattern, after I made a few I decided I was crazy & turned them into kitty toys. Yours is really beautiful, I love the way you sorted them by colors, too. the apple cozy is cute! Very nice! I especially love the hallway colours. Very much up my alley! Of course all of them look gorgeous and squishy and soft! Wow! That's a ton of hexipuffs! At a guess how many would you need for a finished quilt. I'm still trying to keep myself from starting one LOL! You are a puff-making machine! I'm so impressed, and a little envious. And now you've got me thinking that I'll do best to sort them into color families before assembling. Though I suppose that can wait until I have more than 2 of them. Heh. I made one of those apple jackets last week too. Although I need to do a little jigging (or re-reading) of the pattern as it didn't seem to come out quite right. I'd like to find a smaller project for those delightful little hexipuffs, as much as I'd absolutely adore a huge throw made out of puffy goody, I'd like something more immediately complete. The hexipuffs are just lovely! I can't wait to see all of them. Love that apple jacket project. Such a cute addition on something so nutritious. A nice gift that would be for a teacher. Love your little hexis; I laugh at how a little thief of cuteness stowed some away. Super cute!! You're really moving along on the hexipuffs too! Look at all those hexipuffs! I have to admit that I think that I need to see a finished blanket in person 'cause I'm not quite convinced yet. But yours are very pretty. I hope you do something with those puffs soon, I'm dying to see them made up! The apple looks so cute with the cozy.. the button adds to the cuteness. and your beekeeper quilt is coming along nicely..
Wow, you are a like a hexipuff factory. They are looking lovely, even if a couple have gone astray. In my house they would be safely tucked up in my daughter's bed! 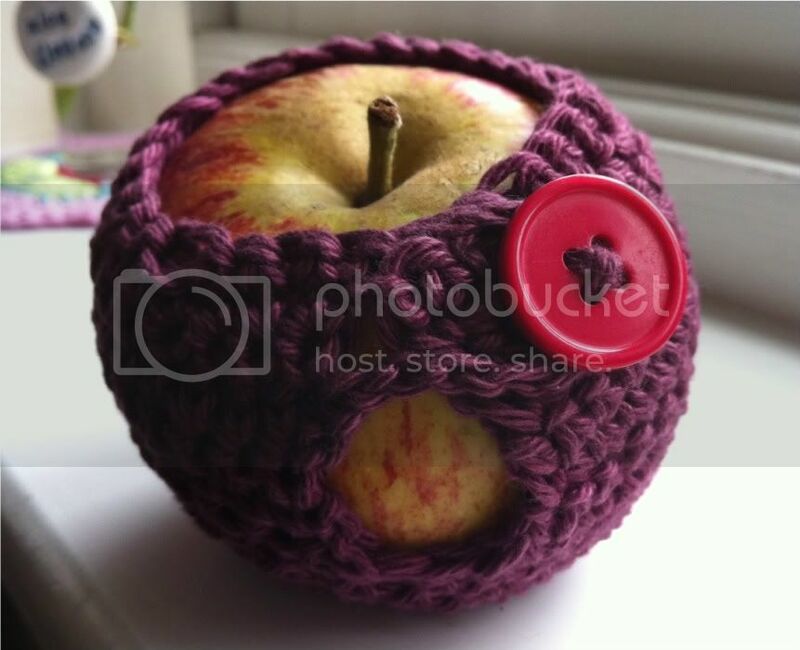 I made an apple cozy recently, they're great fun, I think I'll make a batch for Christmas.